“I cannot change another person by direct action. I can only change myself, by God’s grace. 1. I cannot change another person by direct action. If we look back on all the time, energy, and resources spent trying to change the addict, we will see objectively that what we have done before has not worked. Our best efforts not only did not work to change our loved one, but made us sick. Our emotional, spiritual and physical focus was on the addict, not on God. By realizing we cannot change and control anyone else by our direct action, we step out of co-dependency and on the road to freedom. 2. I can only change myself, by God’s Grace. When we let go of the pressure of trying to change someone else, we can focus on what we can change: ourselves. By taking our mind and effort off the addict and his/her problems, we can examine our own responsibilities. Our reactions and feelings towards the addict are usually an area we need to take responsibility for and give over to God. He will heal, help us change, and continually work in us, when we can see and know what is wrong. Admitting our own problems, praying through them, and giving them to God allows family members to live in freedom! 3. 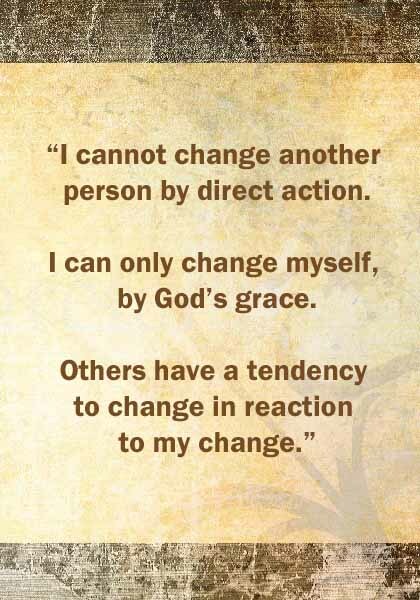 Others have the tendency to change in reaction to my change. By making healthy and positive changes in your own life, the reactions towards the addict will change. Patterns of behavior and speech towards others, including the addict, will change. Continuous enabling and care for an addicts self-destructive behaviors leads an addict to believe that his or her actions may not have consequences and will be fixed. This allows an addict to be responsible for his or her self, having no one to clean up the mess an addiction leaves behind. This can lead an addict to reevaluate and see a reality of addiction, where problems are not cleaned up and blame is only on the addict. Jesus says in Matthew 5:16, “In the same way, let your light shine before others, that they may see your good deeds and glorify your Father in heaven” (NIV). Thus, a family member changing behavior can not only lead to change in dynamics of a family, but can lead to glorification of God. I’m currently at Liberty Lodge Ministries in Titusville Fl., this plays a huge part in what we are doing with the help of God’s grace.